Energy and labor cost reduction, high operating efficiencies, and environmental safety are advantages of powder coating that attract more and more finishers. Great cost savings can be found in each of these areas. When compared with a liquid coating system, a powder coating system has several obvious significant economic advantages. There are also many advantages that may not appear significant by themselves but, when collectively considered, contribute substantial cost savings. Although this chapter will try to cover all cost advantages of powder coating, each individual application must be analyzed in light of its particular needs, and appropriate cost advantages must be adapted to that situation. The specific areas covered relative to the economic advantages of powder coating systems are: energy savings, labor cost savings, higher operating efficiencies, environmental factors, plant safety, and capital costs. One of the most significant advantages of powder coating is that it does not require special air makeup to the coating booth. Since powder contains no compounds that are volatile at room temperature, air makeup for the booth can be recirculated to the plant-quite advantageous to a plant where extreme weather conditions are prevalent. The cost of heating booth makeup air is a sizeable figure in most coating operations, and considerable savings result if it can be avoided. 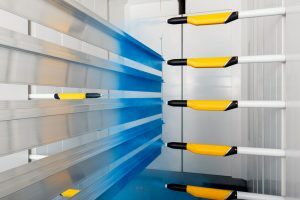 The labor cost savings of powder coating depends on the individual finisher’s requirements; however, there are definite potential labor savings to be considered. When the powder is delivered to a user’s plant, it is ready to use; no need to mix any solvents or catalysts prior to application, as is necessary for many liquid coatings. Once the application process is operating, there are no critical operating parameters to maintain, such as viscosity and pH, as is the case for many liquid coatings. Nor are there percent solids, specific resistance, binder to pigment ratio, and MEQ levels, which are necessary for electrocoating systems. The level of skill and training required of an operator for a powder coating system is less than that needed for liquid systems, and significantly less than for electrocoat systems. There also may be labor savings because better overall coverage can be obtained with automatic powder coating equipment. Often less, or no, manual reinforcement is required. This depends largely on production requirements and part configuration, but is a factor to be considered. Economic advantages resulting from higher operating efficiencies are many and varied, depending upon the particular operation. The most significant advantage is the material usage efficiency. Fluidized bed operations are inherently 100% efficient, although some loss may result from such items as drag out and excess film. Electrostatic spray operations are usually considered to be between 50 and 80% efficient upon first use of the powder. That is, from 20 to 50% of the material is over-sprayed and, if collected, can be reused as satisfactory powder. Since over-sprayed powder can be reclaimed during the application process and therefore reused, overall material utilization in the range of 95 to 98% can be achieved. By comparison, liquid spray coating systems can achieve material usage efficiencies only in the range of 20 to 90%. With electro-coating, 98 to 99% efficiency is possible. Since powder greatly reduces drip, run, or sag, a significantly lower reject rate can be achieved. If badly sprayed parts are discovered prior to curing, they can be simply blown clean with an air gun, and then recoated. Since there is no flash-off time required when using powder coatings, a finisher can use the saved plant space more efficiently and economically. In addition, there is less chance of particulate and dust contamination, which could take place during the flash-off period. This results in fewer rejects for the powder coating product. Powder coating can achieve equal or superior film properties compared with liquid coatings-in most cases with only one coat, eliminating the need to prime a part prior to top coating. In addition, since powder coatings develop full cure during the baking cycle, and usually resistance better than liquid coatings upon leaving the oven, less damage will result during the handling, assembling, and packaging operations. This decreases the need for touch-up and, again, the reject rate will be lower. Both items contribute to savings. Finally, the amount of space required to store powder, and the space occupied by the powder coating system itself, is considerably less, in most cases, than the space required for an equivalent liquid coating system. This allows more productive and efficient use of available plant space. Capital costs associated with installing a powder coating system are becoming more competitive with a liquid coating system. They are well below those required for an electro-coating system. There is also an additional cost for the laboratory equipment necessary for maintaining an electro-coat tank. In many cases, finishers are experiencing a one-year or less payback period after installing their powder coating system. In some cases, it may be more difficult to put a dollar figure on the economic advantages of powder coating when considering the environ- mental factors. However, there are significant factors that can be readily measured. Since there are effectively no solvents in powder coating, and as much as 70% of various solvents in a conventional coating, powder coating can achieve an environmentally “clean” finishing line. As regulatory agencies further limit the amount of solvent emissions allowed, more and more finishers using liquid coatings systems must install costly afterburners to incinerate the emitted solvents. In almost every case, a solvent only adds to the cost and detracts from the properties of a cured coating. Another significant environmental factor is the increased difficulty and cost of disposing of the hazardous waste generated by liquid coating application. In some cases it is nearly impossible and is a responsibility that lingers for years. Consider the economic advantages of powder coatings in conjunction with plant safety. Since there are effectively no solvents in a powder coating, the significant reduction in fire risk could reduce a plant’s insurance premiums considerably. In addition, any spillage of powder outside the coating booth can be safely and easily re-moved by an industrial vacuum cleaner fitted with an air-driven or dust-tight electric motor. There is also a reduced health hazard to the operator in a powder coating system, since there are no sol- vents to cause nose, mouth, throat, skin, or eye irritations. There have been rare cases where a powder caused skin irritation. Powders can be abrasive by continued contact with contaminated clothing or gloves, and proper care should be taken. Problems can be avoided by washing with soap and water. The improved worker environment can result in lower employee absenteeism, which could be a significant economic advantage. Many published articles give cost justifications for powder with comparisons to liquid. The most important figure in such evaluations is the net cost per square foot or per item to successfully coat the product with a suitable finish. When considering costs, the entire finishing system, starting at the entrance area and including everything that adds cost to the manufacturer throughout the expected life of the product, must be considered. This should include items returned and product liability. Energy washing, drying, spray booth and oven makeup air, curing oven. Rejected parts due to finish, Le., runs, sags, scratches, and other damage to the finish. application, curing. There are many economic advantages of powder coating that should be considered when preparing a justification for a powder system. The individual requirements and needs for each application will put a different emphasis on every considered area, be it energy, labor, operating efficiency, environment, or safety. It is not practical in this presentation to cover specific costs for any single installation. The matter can, however, be treated in a rather general way.